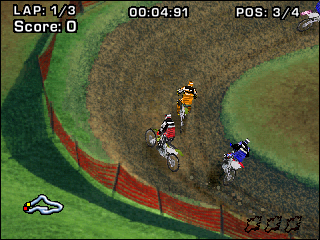 Gizmondo Motocross 2005 is a freestyle racing game that adopts an isometric viewpoint. There's nine bikes available and the modes on offer are Cup (eight track tournament), Quick Race (complete objectives to unlock bikes), Ghost Race (compete against your best time) and Multiplayer (challenge a friend via Bluetooth). While racing, points and boosts can be earned by performing mid-air tricks, such as Nac-Nacs and Heel Kickers. Once the action begins, it takes a while to get used to the sensitive controls and blistering speed; for the first few races you'll likely be veering off course with regularity, but once you take a more cautious approach and use your brakes everything becomes more manageable. The racing reminds me of Excitebike 64 (2000, N64) in that you're always walking the fine line between riding like a pro and being totally out of control! It's chaotic, but in a fun way and the quick, bite-sized nature of each race is perfect for a mobile device. The tracks aren't particularly memorable from an aesthetic point-of-view, but they are expertly designed and challenge you in different ways; for example, while Badlands has plenty of well-placed hills and hairpin turns, Arena is extremely narrow and requires carefully precision to avoid riding out-of-bounds. My main complaint is that there's only nine bikes and eight tracks, and the game doesn't give you many reasons to stick around. The Quick Race mode is actually quite innovative, and rather than just being singular races it tasks you with completing challenges; these include winning without boosting, and finishing first after each lap. This is a great idea (basically acting as a mission mode) that adds variety considering it's the only way to unlock better bikes for the Cup mode. Gizmondo Motocross 2005 is undeniably light in the content department, but if you can take it at face value there's a lot of fun to be had in the 2-3 hours it takes to unlock everything. The intense racing goes hand-in-hand with the excellent level design, and there's a nice contrast between each of the available modes. Random trivia: Housemarque also developed the similar looking Flo Boarding on the Nokia N-Gage in 2003.